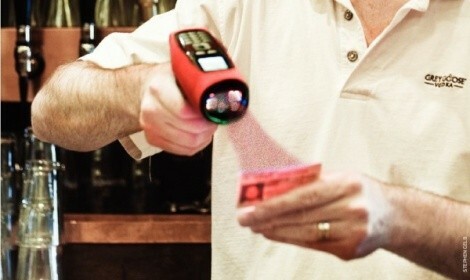 Salt Lake City bar owners weigh in on the effectiveness of ID scanners. The bouncer and bartenders at Keys on Main have to stay alert for many potential problems, especially people drinking too much or minors trying to get into the bar. On nights when the line stretches out the door, such as Tuesday karaoke, bouncers also have to collect cover charges and check IDs before people come inside. All of that is made more difficult because of the new ID scanners required by state law, says Brandon Isenhower, head of security at the downtown piano bar. The scanners used at Keys on Main require a couple of minutes to process IDs, which takes bouncers away from the job they should be doing: policing the bar. Relying too much on technology to vet IDs could, potentially, lead to greater problems. Because the bar codes are often on the back of licenses, people have started handing bouncers their IDs upside down. Additionally, since many fake IDs are actually real driver licenses borrowed from friends or relatives, the scanner will show them as valid. What this means is that even if more IDs are getting scanned, fewer individuals are really getting scrutinized—especially if the bouncer is inexperienced or lazy—since catching somebody underage is as much about checking the person as the ID. Isenhower’s club uses a Hostech scanner, developed locally by Nick Call, a computer contractor who shares office space with City Weekly and has worked on projects for an affiliated company. Other scanners popular in the Utah market include those made by ID Verify and Lehibased Code Corp.
A number of bar owners interviewed for this story agreed that the potential exists for more underage drinkers to get into bars because of the scanners, but emphasized it was really up to the bar to make sure that doesn’t happen. Bob Brown, who owns downtown’s Cheers To You, described the scanners as “kinda useless” when it comes to catching fake IDs and says that “a lot of people checking IDs are lazy and will just rely on the technology.” But in his case, he has incentivized his bouncers and bartenders for years by offering a $100 bounty for any fake ID. Have no doubt, however: Brown, like most bar owners interviewed, greatly prefers the scanners to private-club memberships. And as for reducing underage drinking, he says even if the scanners do not make a practical difference at the bar door, simply having the new law on the books has discouraged minors. Among bar owners, there is still confusion about how bars are supposed to handle the data on the scanners. Some are uploading it into their own computer database, others are sending each scan to an Internet database, and many simply shrugged and said the company that supplied their scanner had programmed it to purge records after seven days, as required by law. While there may be confusion among owners, Keith Zuspan, a compliance officer with the Utah Department of Alcoholic Beverage Control, hasn’t seen any problems with the scanners. The DABC annually audits every license holder in the state, and in the seven months since the scanners came into being, he says that every scanner they’ve looked at — which is about half of the scanners in use — is working properly. During the audits, they make sure scanners are being used properly and deleting records in the proper time frame. As for concerns about misuse or reduced security, he says that it’s like anything else — a bar has to prevent underage drinking and overconsumption. The scanners should not be the primary security measure. “It’s still a tool, not a fail-safe,” he says. Sen. John Valentine, R-Orem, who sponsored the liquor reforms in 2009, says that there could be some proposed amendments to the scanner requirements, although they won’t happen this year. Legislative leaders and Gov. Gary Herbert all have agreed that substantive alcohol legislation will not be considered during the current legislative session. Next year, there are some issues they want to look at, including clarifying how bar owners are supposed to handle the data. There were also some things missed in the 2009 legislation, such as taverns not being required to have the scanners, Valentine says. But based on reports he has heard and his visits to a number of bars after scanners were put in place to see how they worked, the scanners “are working well.” If there is a security issue, however, it may need to be reviewed. One thing that bartenders and owners want changed is the current requirement to check anyone who looks to be under 35 years old. Tracey Bagley, manager of the Leprechaun Inn in Millcreek, says, with a laugh, “Everyone looks under 35 now.” If the age were lowered to 30, fewer middle-age people would need to be checked. The Leprechaun uses its scanner a lot, she said, in part because it’s simple to use. In fact, about the only complaint she had is that batteries for their handheld Code Corp. scanner need to be charged every night, and on busy nights, even a fully charged scanner may not last. Thus, they have a back-up scanning system (supplied by Hostech).